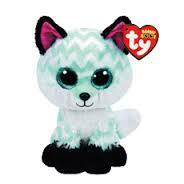 Here’s your a list of 2017 Beanie Boos, just released into the wild. 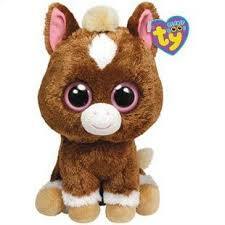 We’ll keep adding to this list throughout the year as new Beanie Boos come out. 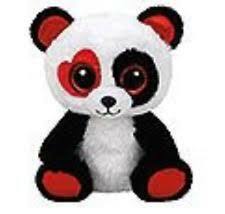 We’ve done our best to provide pictures for each new Beanie Boo release, but in some cases, we don’t have a photograph yet. 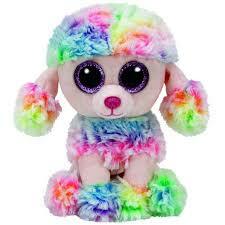 Rainbow is a rainbow-colored poodle. She was released in January. Tag phrase: They call me Rainbow because of my hair. It has style and flair and it’s the coolest to wear! Her birthday is November 10. George is a black gorilla with purple sparkly eyes. George was released in January of 2017. Tag Phrase: I get excited when my friends visit me. We talk and eat fruit, while we sip on our tea. George’s birthday is October 18. Tala is a brown and white dog with brown sparkly eyes. Tala was released in January of 2017. 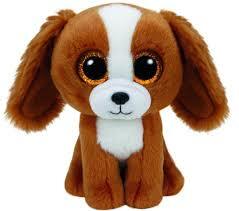 Tag Phrase: I’m a smart dog, I can rollover and crawl, And I will fetch when you throw the ball! Tala’s birthday is October 9. 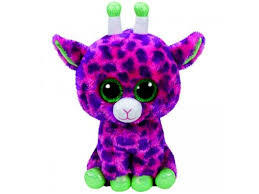 Gilbert is a purple and green giraffe with green feet, ears and eyes. Gilbert was released in January of 2017. Tag Phrase: I like to lick peanut butter off a spoon, But my mouth gets real sticky so I can’t sing a tune. Gilbert’s birthday is August 23. 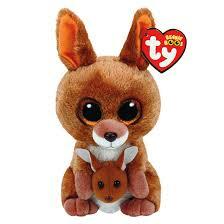 Kipper is a brown kangaroo with a baby in her pouch. Kipper was released in January 2017. Tag Phrase: My baby must stay close to home, Until she is old enough to safely roam! Kipper’s birthday is January 28. 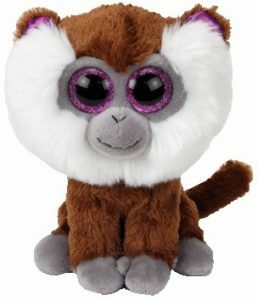 LeeAnn is a lavender lemur. LeeAnn was released in January 2017. Tag Phrase:I like to play with my brother who’s older, We roll on the snow hills when it gets colder! LeeAnn’s birthday is December 5. 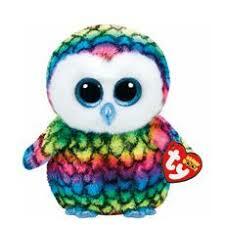 Owen is a rainbow-colored owl with a blue beak and blue sparkly eyes. Owen was released in January 2017. Tag phrase: I like to fly high above the trees, And feel the crisp cool autumn breeze! Owen’s birthday is September 12. 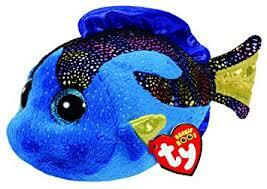 Flippy is a purple and rainbow-colored fish with purple sparkled eyes. Flippy was released in January of 2017. 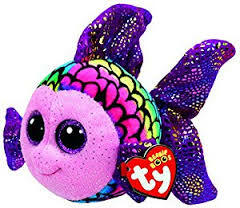 Tag Phrase: I have big fins and I’m really cool, They really sparkle when I’m in the pool! Flippy’s birthday is January 3. Aqua is a blue and yellow fish with blue eyes. Aqua was released in January 2017. Tag phrase: When I’m in the reef, I’m a happy fish, And playing all day is my only wish! Aqua’s birthday is February 18. 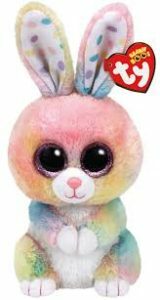 Bubby is a pink, blue, yellow, purple and green rabbit (Easter colors) with light purple eyes. Bubby was released in January of 2017. Tag Phrase: I like to fly high above the trees, And feel the crisp cool autumn breeze ! 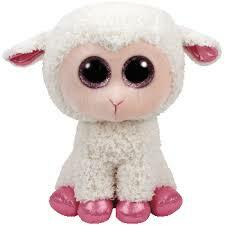 Twinkle is a pink and white lamb. Twinkle was released in January of 2017. Tag Phrase: My home is always on the farm, It’s cozy with its southern charm! Twinkle’s birthday is May 11. 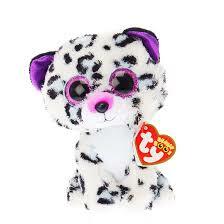 Violet is a black, white and purple leopard. Violet was released in January of 2017. Tag Phrase: My fur is the prettiest in all of the land, And I’m the best looking in my marching band! Violet’s birthday is July 15. Pipper is an aqua and white dog with pink ears and aqua-colored eyes. Pipper was released in January 2017. Tag Phrase: I’m a pretty fox with nice pink ears, So stay my friend throughout the years! Pipper was born on April 6. 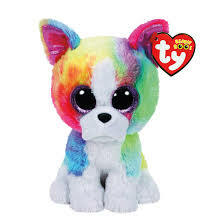 Isla is a rainbow-colored chihuahua released in January 2017. Tag Phrase: I like to hang out with my friends and play dress up, It’s fun doing hair and putting on makeup! Isla’s birthday is May 11. Valentina is a black, white and red panda released in January 2017. Tag Phrase: I always want to be with you, And I only hope you love me too. Valentina’s birthday is February 10. Nugget is a yellow chick with green wings and eyes. Nugget was released in January of 2017. Tag Phrase: I may be a little chick but I am very strong, Tie a ribbon around my neck and I will sing a song! Nugget’s birthday is June 17. Maple is a brown and red moose released in January 2017. Tag Phrase: Canada is our country celebrating 150 years of freedom, strength and diversity. Maple’s birthday is July 1. 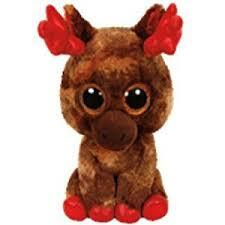 Harriet is a brown and white moose with pink eyes and pink ears. Harriet was released in April of 2017. Tag Phrase: I’m very important and my name is Harriet. Because my special job is to lead the chariot! Harriet’s birthday is December 20. 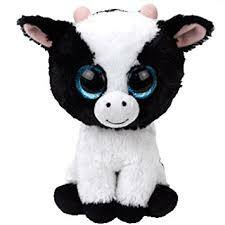 Butter is a black and white cow with blue eyes. Butter was released in April of 2017. Butter’s birthday is January 12. 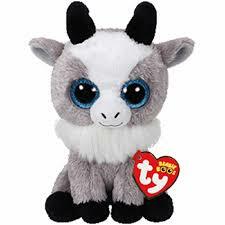 Gabby is a grey and white goat with blue eyes. Gabby was released in April of 2017. Tag Phrase: Let me be your very best friend. Then our play time will never end. Gabby’s birthday is June 2. 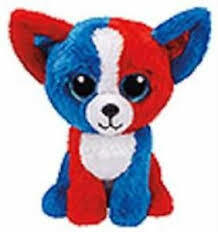 Valor is a red, white and blue dog released in March of 2017. Tag Phrase: I’m covered in red, white and blue, And to my country I will always be true. Valor’s birthday is July 3rd. 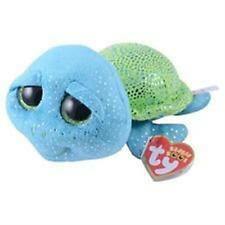 Cara is a blue and green turtle available at Sea World. Cara was released in March of 2017. Tag Phrase: I am a turtle, the Loggerhead kind. My head is real big, and I live a long time. The sea is my home, so I hope you understand. When you play by my house, don’t leave trash on the sand! Cara’s birthday is March 1. 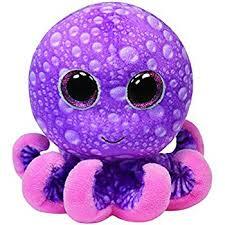 Inky is a purple and pink octopus released in May of 2017. Tag Phrase: I’ll spray ink if you get close, And it’ll really stain your clothes! Inky’s birthday is March 24. 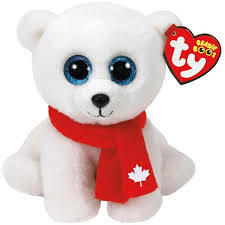 Nanook-Nanuq is a white polar bear who lives in Canada. Nanook-Nanuq was released in May of 2017 to celebrate Canada’s 150th anniversary. Nanook-Nanuq’s birthday is July 1. Freckles is a brown, black and white leopard. 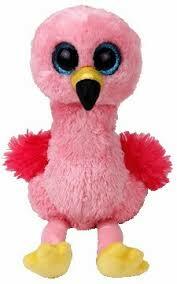 Gilda is a pink flamingo with blue sparkly eyes. Tag phrase: I like to tell jokes and act real silly, I am funnier than my brother Billy! Gilda’s birthday is February 26. 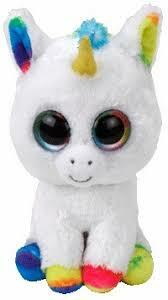 Pixy is a white unicorn with rainbow hooves and ears and rainbow sparkly eyes. Pixy has a golden horn and her birthday is May 26. Tag phrase: At carnivals I ride the ferris wheel, Then play some games and eat a meal! 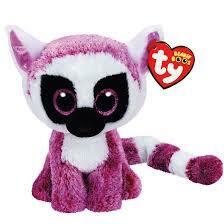 Tamoo is a brown monkey with purple sparkly big eyes and purple ears. 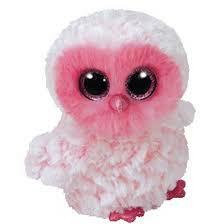 Twiggy is a pink fully owl with pink feet and pink sparkly eyes. She was introduced in June of 2017. Tag phrase: I’m glad to have a friendship with you. We can share clothes and even shoes! 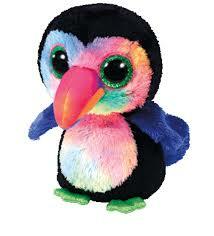 Beaks is a toucan bird with rainbow-colored and black fur and a rainbow-colored beak. Beaks has green eyes and was introduced in June 2017. Tag phrase: Fruit is my favorite food to eat, I even like it more than meat! 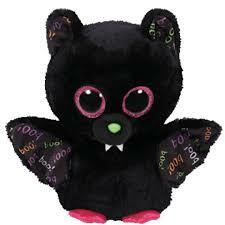 Dart is a black Halloween bat. Tag phrase: Sometimes I can act a little batty. When I eat a peppermint patty! Hairy the spider. To be released in August of 2017. 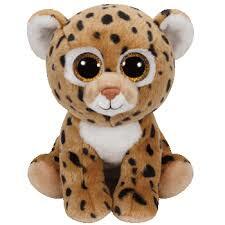 Tag phrase: I like to crawl all over the house, I am fast and quieter than a mouse! Hairy’s birthday is September 9. 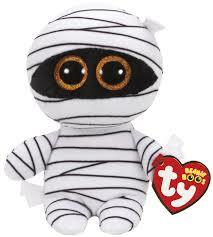 Mummy is a mummy! Mummy was released in August of 2017. 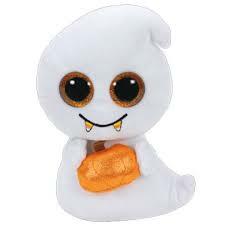 Tag phrase: You should be frightened when I scream, Cause being a ghost is my favorite dream! 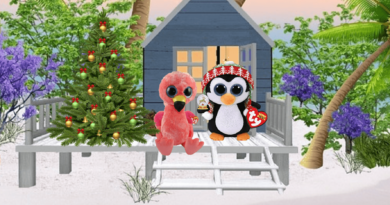 Penelope is a Penguin and will be released for Christmas. 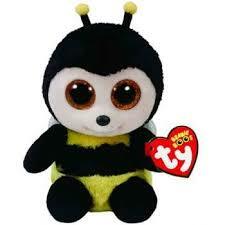 Buzby is a yellow and black bee. Buzby was released in June of 2017. Tag phrase: I’m a very busy bee, I fly so high it makes me dizzy. Buzby’s Birthday is April 14. 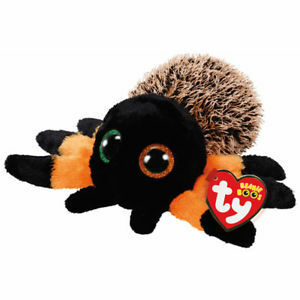 Beanie Boos can also be bought on Amazon.